Jesus in Love Blog: Brother Elias: Soulmate to Saint Francis of Assisi? Brother Elias: Soulmate to Saint Francis of Assisi? The earliest companion of Francis, a man whom Francis “loved more than any other because he was the same age” and because of “the great familiarity of their mutual affection…” is quickly written out of all but the earliest biographies and becomes fully lost and cleansed from later biographies. There is reason for suspicion about his removal from the story of Francis as the officially sanctioned image of St. Francis “the Saint” grew more widely circulated in the Medieval Church. One possible candidate for Francis' first, unnamed companion is Brother Elias. The noted Franciscan historian, John Moorman, puts forward this supposition in his book, A History of the Franciscan Order (Chicago: Franciscan Herald Press, 1988. p. 96). In Celano's First Life of Francis, Br. Elias is not overtly named until Chapter 25, with no introduction or description, as if he is a character in the narrative already previously introduced. And yet, in spite of seemingly appearing only by Chapter 25, Elias is one of "three other historical figures [which] find an honored place within the pages" of Celano's work (St. Clare and Pope Gregory are the other two; Francis of Assisi - The Saint: Early Documents, NY: New City Press, 1999; p. 173). If the important figure of Br. Elias has already appeared in Chapter 3, it is more cohesive to the narrative when he reappears in Chapter 25 wherein the text [re]introduces him [again ?] with Francis "on another occasion and brother Elias was with him..."
At his death, Elias writes a letter to the Franciscan community, to share the distressing news of Francis' passing. Yet in this letter Elias describes it as "a loss for all, yet it is a trial singularly my own." He writes: "I sigh... My groans gush forth... what I dreaded has happened to me..." That this death is personalized for Elias is explicit. Elias remembers Francis as one who "carried us in his arms like lambs..."
Elias continues with praise of Francis' body itself. His letter betrays a clear intimacy he knew with Francis' body: "...our brother... bearing in his body... His hands and feet...front and back revealing the scars... His side...often emitted blood...No part of his body was without great suffering...His limbs… marvelously soft and pliable...turned this way and that..." Clearly Elias is writing from a personal and physical intimacy with Francis. Interestingly, it is St. Bonaventure, the fifth successor to Elias as Minister General of the Order, who writes Elias out of Francis' official biographies. 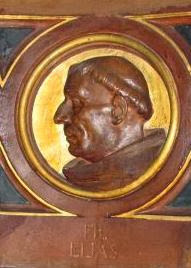 Bonaventure orders all earlier biographies of Francis to be destroyed. He then authors two "official" biographies of Francis and removes all mention of Francis' earliest, first companion. While he includes two episodes of Elias' role in Francis' life, Bonaventure does not name him, whereas other early friars are explicitly named. In describing Francis' blessing which he extended prior to his death, Bonaventure removes Elias as the recipient, and instead describes the blessing as being given generally to the friars "sitting around him." Subsequent biographies eventually adopt a trajectory openly hostile to the depiction of Elias. However, notably, St. Clare, another intimate companion of Francis and contemporary of Francis, gives an affirmation of Elias in the strongest possible language. She writes to Blessed Agnes: "In all of this, follow the counsel of our venerable Father, our Brother Elias, the Minister General... Prize it beyond the advice of the others and cherish it as dearer to you than any gift." Sweeney appears to lack imagination when trying to explain Francis and Elias' "intimacies" with each other, seemingly forgetting that Francis was able to publicly disavow his childhood, birth family and its attachments. Childhood nostalgia did not seem to be a motivating force for him. Readers would do well to read Giulia Barone's article, "Brother Elias Revisited" (Greyfriars Review, Vol. 13; 1999) to obtain a more balanced portrait of Elias, set in an historical context and explaining later factions need to rewrite Elias' story and character according to their own political agendas. Kevin Elphick is a Franciscan scholar and a supervisor on a suicide prevention hotline in New York. He wrote a thesis on “Gender Liminality in the Franciscan Sources” for a master’s degree in Franciscan studies from St. Bonaventure University in New York. Thank you for taking time to share - to teach - you've given me some new depth. I find this article very interesting. For as long as I can remember, I have found myself drawn to Francis. I took the name Francis as my confirmation name when I was 12. At one time in my life, I applied to join the Franciscan Order, and part of me still mourns not being accepted. I haven't read anything about him in over 20 years, though at one time I think I probably owned 7 or 8 different books on his life. Of course, none of those books so much as hinted at this side of Francis. And yet, as I read this, it is of no surprise to me. Well, now I can call you Eric Francis! I was touched by your comment. I didn’t know that you once wanted to be a Franciscan… and were turned down. I’m sure Francis himself would have welcomed you. Maggid, I am happy to serve as your teacher here. Thank you for taking time to leave a comment. I can't help thinking this article is under written. It makes no mention of Elias's divisive influence on the Franciscan order. He seems to have had a gift for annoying people. Many of Francis early followers felt that Elias perverted Francis original vision by abandoning the early Franciscans commitment to absolute poverty and turning the Franciscan order into something far less radical. He was such an inveterate political schemer that he betrayed the Pope by joining his enemy and riding to war with the Holy Roman Emperor. He was actually deposed as leader of the order and excommunicated. He, however was received back into the church before he died. I think this controversial life was the most likely reason that Bonaventure airbrushed him out of the official life of Francis.